Lately I have a bit of an obsession with cross stitch. There’s something so satisfying about feeling all those little stitched crosses all neatly sewn in a grid. I have been completing some projects using other people’s designs, but wanted to design one myself. 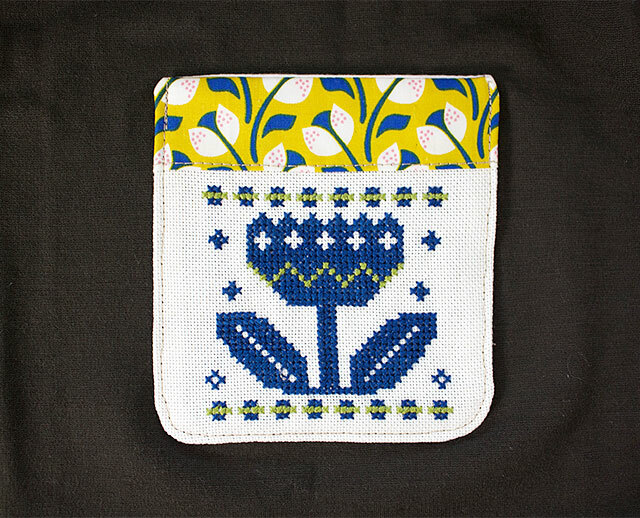 I came up with a small flower motif, and then added some patterned fabric at the top. 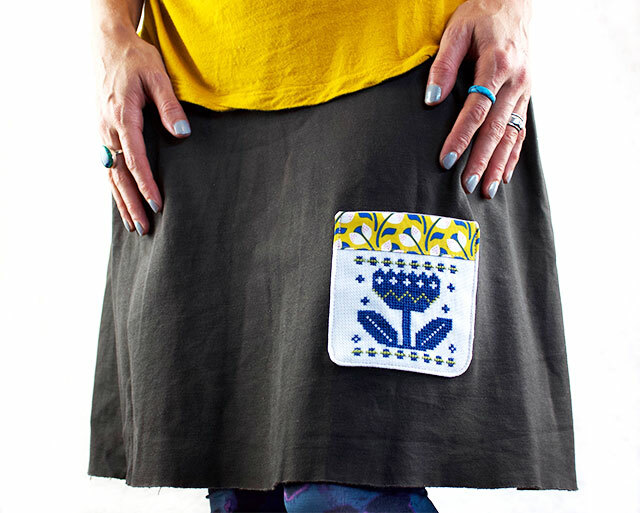 I then decided to turn it into a pocket to adorn a skirt that I already owned. 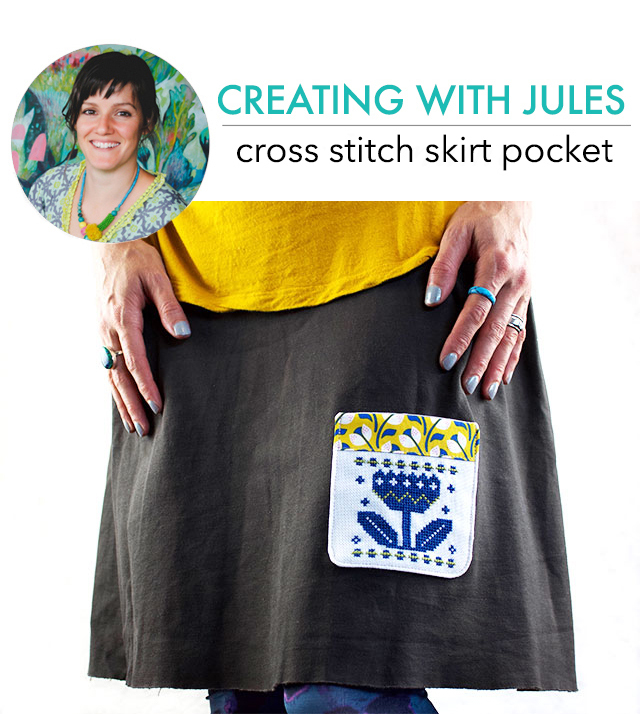 So grab your embroidery thread, and a skirt that needs a jazz- up, and get stitching! You can stitch this in whatever two colors you want. I have given the numbers for both Anchor and DMC embroidery thread. Optional: I ironed a piece of interfacing to the reverse of my even-weave fabric, as mine was quite floppy to work on and I also wanted to hide threads showing through from the back. This also helps stop the edges of the even-weave fabric from fraying. 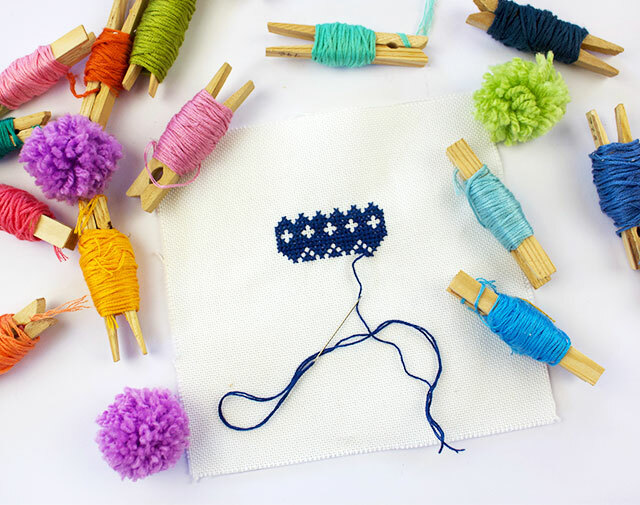 Start cross stitching your pattern using 3 strands of embroidery thread. 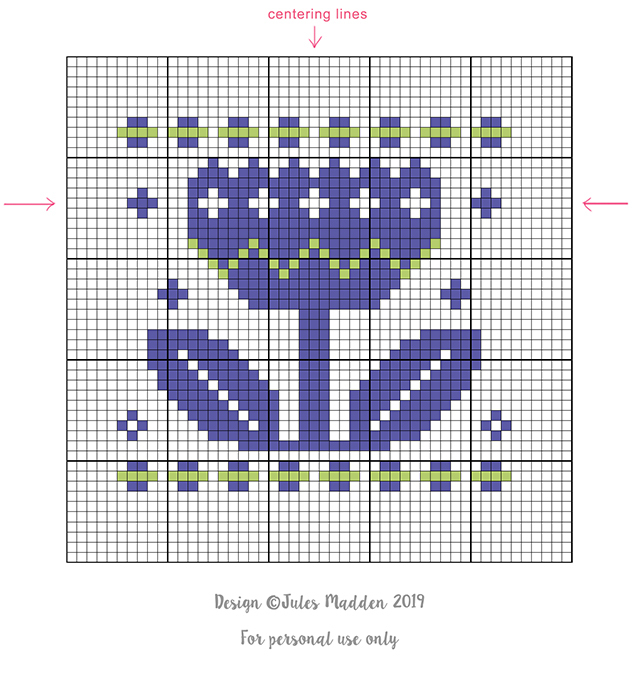 Cross stitches are simply little crosses stitched into the fabric, and it helps give the piece a neat look if all your cross directions are going the same way, ie. the first stroke of the x going one way, then the second stitch of the x all going the other way and then keeping them all the same on each subsequent cross stitch. 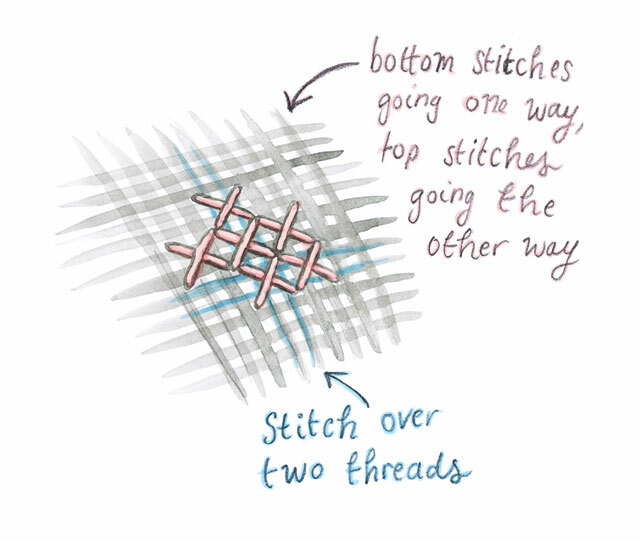 With even-weave fabric you need to stitch your crosses over two threads like in the diagram. Press your work when complete. Take the patterned piece of fabric and fold under one of the long sides towards wrong side 1/4” and press. Pin to the top of your panel making sure it’s centered, placing it 1/4” away from the top of the cross stitch design. Top stitch fabric close to the fold. Make a pocket template by drawing a 4 1/2” h x 4 1/4” w rectangle. Add a slight curve to to one bottom corner, and repeat the curve on the other side by folding your drawing in half to make the curves match. Now draw a 1/4” seam allowance all around and cut the pocket template out. Lay template on wrong side of your plain cotton fabric and trace around and cut out. Then, cut the seam allowance away from your paper template, lay it back onto your fabric and draw around the template. This is your sewing line. 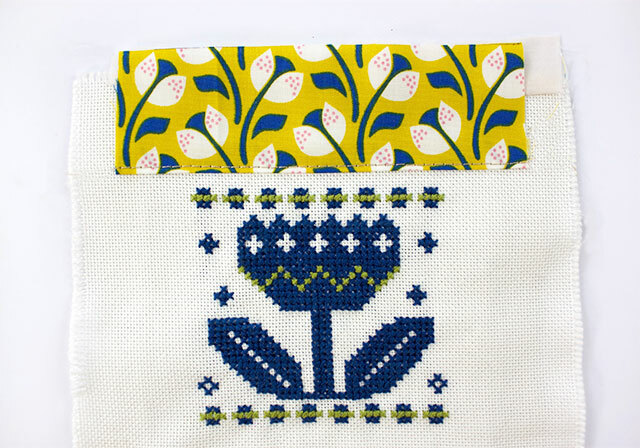 Pin the fabric to the top of your cross stitch, making sure the cross stitch design underneath is all centered nicely. 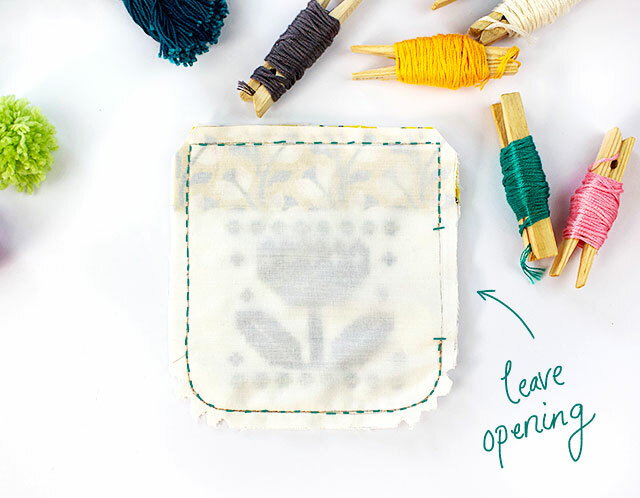 Sew all around your pocket on the sewing line, leaving a small gap, around 2”, at one side. Clip corners and turn right side out, poking the corners out with something pointy. Press and then and pin in place to your skirt. 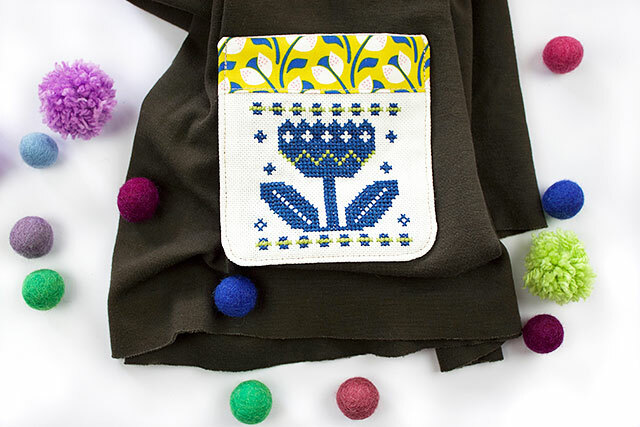 Sew around the pocket close to the edges, leaving the top open and backstitching at both ends. spring bundle- 24 hour flash sale!